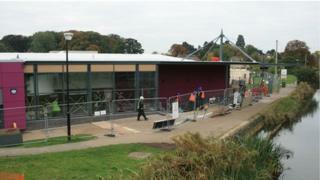 A Lincolnshire sports centre which has been shut for a year for refurbishment is set to open its doors again next week. The Sleaford Leisure Centre closed last October while work was carried out to build a new pool and a larger gym and to revamp its changing rooms. The outside of the 140-year-old centre was also rebuilt in the £2.85m project. Project manager Scott Masterman said the age of the centre had posed some challenges during the work. "I think we have found an awful lot of things in the ground such as concrete pits that possibly date back to 1872 when the original pool was built," he said. "We have also found the pipes that go to the River Slea as well so that was an interesting one when we dug those out. "We have had some fun filling those in, but it is character-building when you work on these projects." The leader of North Kesteven District Council, Councillor Marion Brighton, said: "The origins of this centre are in the riverside lido of 1872. "It is such a joy that 141 years on we are able to welcome new generations from across the district to swim and exercise in these most modern and comfortable facilities." The centre will reopen on Tuesday.